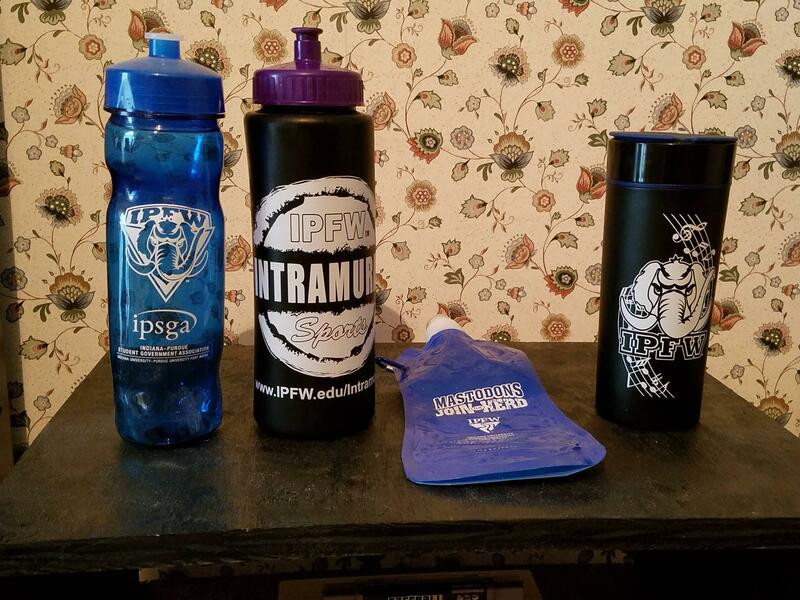 While being a student at IPFW, I have always taken free stuff at IPFW events. They often offer water bottles and here I will review the four I have been given so far. Water bottle 1 was given to me during registration and originally contained cards and a flash drive containing IPFW information. It feels sorta flimsy and while it worked fine for the longest time it's sorta gotten leaky and damaged. I don't know how that happened. Other than that it was a pretty good, straightforward water bottle. Water bottle 2 was given to me for some IPFW intramural sports thingy that I didn't really care about but the water bottle is EXCELLENT. I think it's meant for sporty people so it's very durable (and feels very durable) and has no problems with leaking. I take it with me when I go out on a bike ride, and it fits into the water bottle holder on my bike. I don't know why they used black and purple or the color palette though, but looks aren't very important. Highly recommended. Water bottle 3 is more of a pouch thingy. I haven't really seriously used it because I think it's going to spring a leak and then make a huge puddle. I think it might be good as an ice pack though. The clip could also make it useful that way. Water bottle 4 was from voting for homecoming or whatever. I don't remember. It's some "h2go" branded thermos thingy that says it can keep drinks cool for 6 hours. It has a huge flaw though and it's VERY LEAKY (even when closed) if it's tilted and it drips out a lot if you're even just drinking from it normally. I have to push my bottom lip down to try and stop the dripping when drinking and it's still not enough. I think it's a mistake to use this kind of lid rather than a twist-on one like water bottles 1, 2 and even 3. However, if you keep it upright the whole time and use a straw to drink from it, it should be fine. It feels very durable and feels tougher than 2.